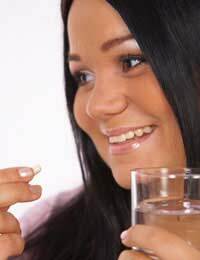 Medications used to stimulate fertility have helped many women who had difficulties conceiving. These medications work primarily by altering the reproductive hormonal imbalance. Some medications can be taken in the form of a pill whilst others require an injection. The type of medication right for each individual will depend on the cause of the infertility. The spectrum of fertility medications generally fall into two classes; follicle stimulating agents and ovulation inducing agents. Whether the medication is taken by mouth or via an injection, the main function of most fertility medications is to promote ovulation. Ovulation is the process by which an egg is released into the fallopian tubes, and has the potential of becoming fertilised by sperm. Clomiphene citrate trade name (chlomid, serophene) is usually the initial medication prescribed in cases of infertility. This medication is an oestrogen receptor analogue which binds to oestrogen receptors within the brain. In normal conditions elevated levels of oestrogen causes “a negative feedback loop” which leads to a decline in FSH. FSH (follicle stimulating hormone) is the principle hormone which stimulates the recruitment of mature follicles. Clomiphene works by circumventing the negative feed back loop and “tricking” the central endocrine glands, the pituitary gland, to producing more FSH. The increased FSH results in overestimation of ovarian follicles, and a greater chance for ovulation. This mechanism however is not without flaws and can result in multiple follicular recruitment and thus increase the risk of multiple pregnancies. Other notable side effects include, hot flushes, visual disturbances and in rare cases ovarian hyper-stimulation syndrome. If after repeated treatments using Clomiphene citrate has failed to result in conception, other injectable agents may be tried. These injectable agents contain the FSH hormone which is usually derived from human urine of postmenopausal women as the active ingredient. As such, this class of medications are called Human Menopausal Gonadotropins. Among the agents in this injectable class are pregonal, humegon, repronex and menopur. Gonal –F and follistim are similar FSH containing agents, but they are genetically engineered and are not a by-product of human specimen. Common side effects include hot flushes, headaches, nausea and vomiting. Human Chorionic Gonadotropin, is usually secreted by the placenta as a result of pregnancy, however, this agent can also help fertility as well. In most females HCG is administered in conjunction with follicle stimulating agents. B-HCG agents exert its effect on the process of ovulation. Once the follicles have been stimulated, B-HCG helps release the eggs into the fallopian tubes. These drugs are usually given one day after the last dose of the gonadotropins, to optimise ovulation after follicle stimulation. The reproductive endocrine system is highly complex, involving multiple organs including the brain. Disrupting this natural process for the purpose of fertility can lead to unwanted effects. Thus it may be beneficial to block the natural process of hormone release. Gonadotropin releasing agents such as Leupron, Genirelix, Cetrorelix, inhibit the natural release of Luteinising Hormone (LH) and Follicle stimulating hormone (FSH), which can impede the effects of fertility drugs.